Thank you to our civil war groups that came to Heritage Days 2010. Many drove over 2 hours to bring their displays and equipment to be with us. 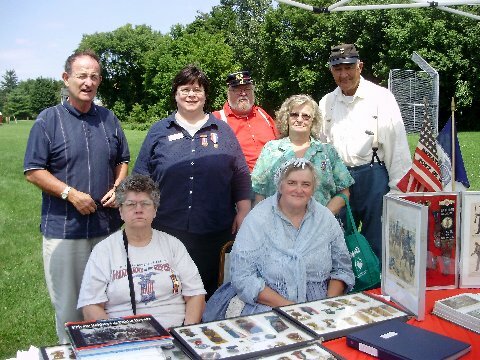 All that attended the events gave positive feedback and the Sons of Union Veterans and Woman Relief Corp tent had a steady stream of interested visitors all day long. They report having had a wonderful time and were greated well by everyone. While it was not planned, we may have set a record at Port Byron as we had all 5 allied orders of the Grand Army of the Republic in attendance. Representing the five allied orders of the GAR. Standing: Jerry Orton-SUV; Dawn Roe-Port Bryon Historian and member of DUV and LGAR, Doug Duell-SUV; Althea Cratsely-PDP, ASUVCW and Lyman Baker-SUV, Dept. Patriotic Inst. Sitting: Gloria Fisher-Dept. President, ASUV and Lorraine Orton-PDP-WRC; Photo courtesy of Jerry Orton. We started the morning with a civil war cemetery tour at Mt. Pleasant Cemetery. The preparation for this event was overly meaningful to me. It is events like this that also enable me to become more connected with the various families that paved the patch in Port Byron's history. 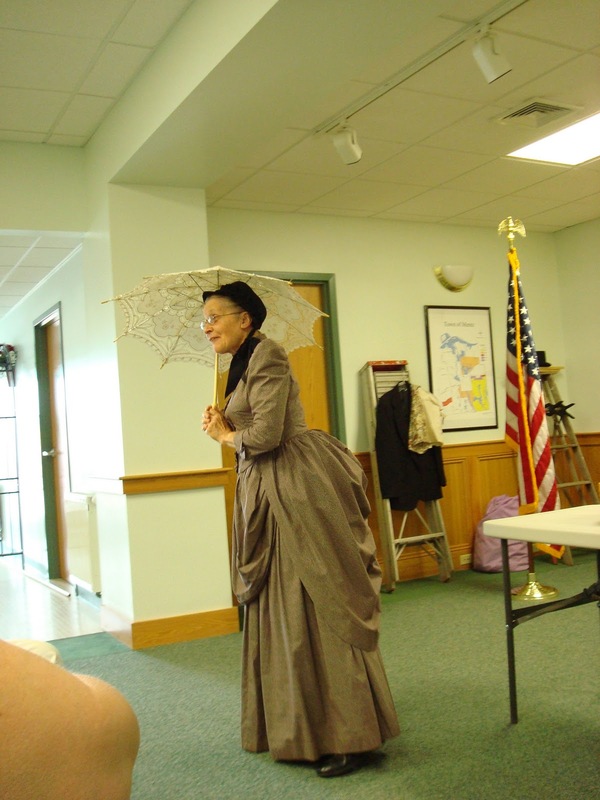 Living history performer Eileen Patch gave a captivating performance as she went back in time portraying the heartache of war as felt by a soldiers mother. The story also mentioned the fate of some neighbor boys that also enlisted. The story unfolded as she shared thoughts of the day on period inventions such as steam power and changes in products that improved daily life of the period. I never knew so many things could find their way to a sewing basket! It was unfortunate that the event brochure neglected to include where she was performing, so people had some difficulty getting to the show, but for those that came it was an event to remember. based on her book This from George. Soldiers developed a deep bond of brotherhood and today the allied orders keep their memories alive. Thank you all for coming and sharing the day with our community. The afternoon finished with a performance by the Dana L West Drama Club. Combine all this history with live music, good food and the other activities, it was an enjoyable afternoon for everyone.